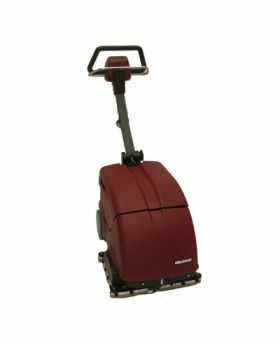 Minuteman Port-A-Scrub 14 is the perfect compact unit for those small areas but still performs like a big scrubber. The P14 auto scrubber features a 14-inch cleaning path and has a cleaning productivity of 7,500 square feet per hour. This walk behind scrubber is designed with a collapsible hand for easy storage. Simple three button operation panel allows for easy use. Optional accessories for the P14 auto scrubber are available.